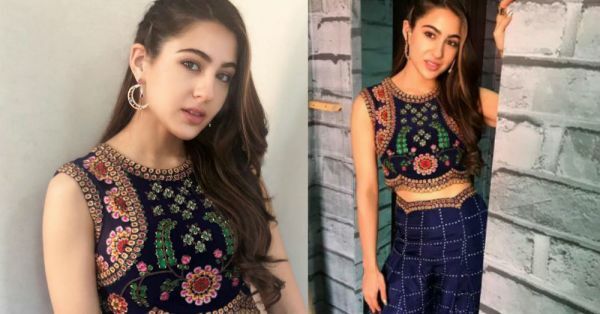 India's new obsession with Bollywood's stunning debutante Sara Ali Khan, her new movie and her wardrobe, is obvious, isn't it? We must admit we're getting there too. Even though this celeb kid didn't quite get off on the right foot with us - thanks to her outfits. Of late, however, the Kedarnath actress has been making appearances looking like a snack. Up until now, Sara had been wearing designers that need no introduction, like Abu Jani Sandeep Khosla, Raw Mango and so on. So it was quite a pleasant surprise when Tanya Ghavri picked out a unique designer ensemble for Sara, which we couldn't identify at a glance but L-O-V-E-D. 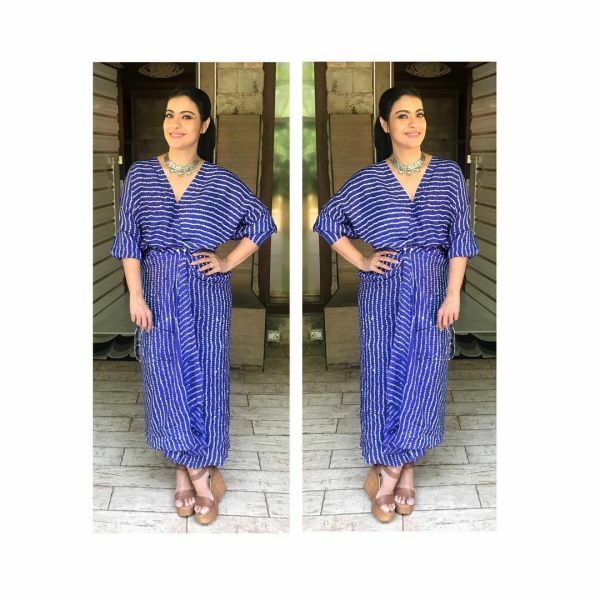 The Indian-fusion outfit that Sara took out for a spin has an embroidered and embellished crop top, which she wore with high-waisted flared pants, both in a deep, navy blue. 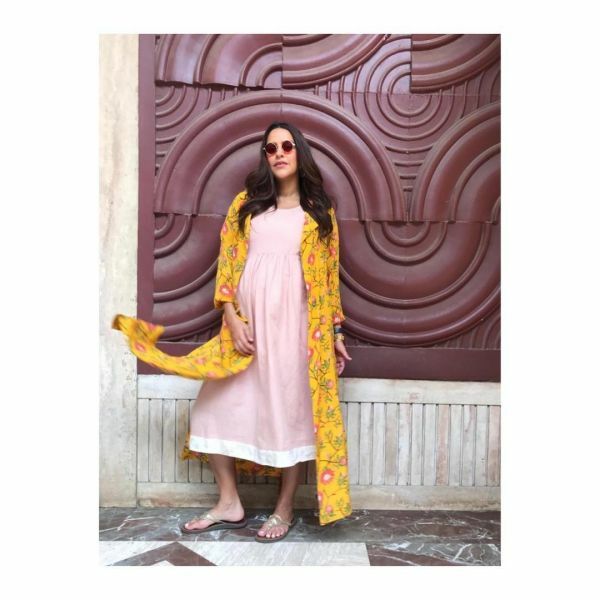 While the top flaunted an evidently elaborate Rajasthani style floral embroidery, Sara Ali Khan's pants featured nautical Bandhni tie-dye print all over. We're also digging the large scallops at the cropped-top hemline and the waistband of the bottoms. It would be accurate to say we're impressed and naturally, we couldn't wait to find out who the designer behind this ensemble was. 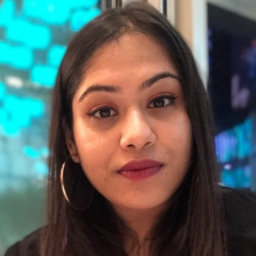 Nupur Kanoi is a Kolkata-based fashion designer who has been around since 2006. FDCI describes as her label as one that "reflects a rich use of global craft and colour merging with embroideries and surface texturing, always with a bit of artistic disarray". Scrolling through her profile, we realised her label has been seen on Bollywood's most stylish ladies lately. These include Shilpa Shetty, Parineeti Chopra, Kajol and Neha Dhupia. Her exotic floral prints are refreshingly different. It is evident that Nupur uses Rajasthani techniques to stylise contemporary, artsy ensembles. Sure enough, we are stalking her official page and falling in love as we do so. BRB!